Leave the heavy lifting to us. The Brick's Premium Delivery Service is more than just the safe transportation of your purchase – it's a commitment to your satisfaction. We offer a comprehensive service designed to handle every detail and give you a seamless experience. The Brick's Premium Delivery Service is available in most metropolitan markets. We also offer our Basic Delivery Service to most of our smaller markets and rural locations. If you're unsure which delivery service applies to you, check our Help Centre or Contact Us. We want to send your order to you as soon as possible on a day that's convenient for you. Our process is designed to offer you the opportunity to choose a delivery date. During the sales process, you can select a delivery date that works for you. This date is based on product and delivery date availability in your area. If you made your purchase in store, you'll receive an invoice from your sales consultant with the expected delivery date or an estimated arrival date if your order isn't currently in stock. If you made your purchase online, you'll receive an email order confirmation, which will specify your preferred delivery date. We'll contact you if this date changes for any reason. Whether you made your purchase in store or online, we'll contact you two to three days before your delivery to confirm product availability, your address and your delivery date. We'll also check if there are any other services, such as installation or assembly or appliance/mattress removal, you may require. If we can't confirm your order then we'll reschedule it as soon as possible. In major markets, you'll receive a call the day before your delivery from our automated service and we'll give you a three-hour courtesy delivery window. We cannot guarantee delivery times due to factors like distance, weather, traffic or other delivery-related delays, so you may potentially need to be available all day for your delivery. If we have your email address, we'll also send you an email the day before your delivery. The email will have a link to our tracker, Find My Delivery, so you can track your delivery status on the day of your delivery. In smaller markets and rural locations, our delivery drivers will contact you directly either the day before or the day of your delivery to provide a three-hour courtesy time window for your shipment. Please contact your Service Store for further details. Since our system automatically assigns delivery times based on product and truck availability, we're unable to change your estimated courtesy delivery time window. You may potentially need to be available for your delivery all day since delivery time periods may be extended due to driving distances, traffic or weather conditions. Please contact your Service Store at least 48 hours before your selected delivery date if you would like to make any delivery date or product changes. Late deliveries are frustrating for everyone, and we know your time is valuable. Preparing your home for your upcoming delivery can help save time and make the experience as easy as possible for both yourself and the delivery team. This also helps keep subsequent deliveries on schedule too. Here's what you need to know to help make your delivery successful. Make sure you measure your entrances and the intended location where you plan on putting your new products. If the space for the product is tight, you have the option of signing a release to clear The Brick of responsibility for any damages made trying to get the product(s) into place, or you can make a reselection (additional delivery costs may apply). We require full payment of your invoice at least 48 hours prior to your delivery date. The Brick can deliver to only one address per sales order. If you're having your product delivered somewhere else, or you'd like to have someone else pick it up, we'll need to confirm those details with you prior to delivery. For online customers, the name on the order must match the government-issued photo ID of the person receiving the delivery. If your home contains more than two flights of stairs and there is no elevator, please contact your Service Store (noted on your invoice or confirmation email) so we can let the delivery team know. Additional charges may apply. Remove tripping hazards or other obstacles from hallways and rooms. Clean snow and ice from sidewalks, paths and driveways. Keep your pets in a secure location. Clean the intended location for your product. Protect your flooring as needed with felt pads or other materials. In most major markets, you can track your delivery status on the day of your delivery using Find My Delivery. Simply enter both your order number and telephone number to start tracking. You'll be able to see your delivery once the trucks are routed in our automated system. The tracker tells you the stop number of your delivery, where the delivery team is currently and if the truck is delayed. Sometimes our drivers may be out of the service area so you'll simply see your stop number. This service may not be available in smaller markets. Please contact your Service Store for questions about your delivery. To help protect you from theft and fraud, we require the person listed on the order to show valid, government-issued photo ID and provide their matching signature at the time of delivery. For your protection, we can deliver your order only when there is a person of legal age present. Our delivery teams are required to wear footwear at all times for health and safety purposes. Please plan accordingly to protect your flooring. Please inspect your product and property prior to the fleet team leaving your residence and prior to signing your delivery slip. We want to ensure you have received your product in good order and that your home is free of property damage. Our delivery teams are not licensed to disconnect gas, electrical or other utilities from your appliances. If you need any appliances disconnected before new products are delivered, please contact our Installation and Assembly team and we can provide this service at a competitive rate. Contact us within 2 days of your pickup or delivery should you receive your product in less than satisfactory condition. We will be pleased to assist you. If you have more questions about your purchase or our policies, please Contact Us or use our handy Help Centre. Property damage claims must be reported within 24 hours of delivery. Should you have an instance of property damage contact your purchase/service location for them to open a claim on your behalf. For Brick customers living in metropolitan areas (major markets), whether you're purchasing new furniture, mattresses, appliances or electronics, here's what you can expect from our Premium Delivery Service. All items requiring customer assembly (marked "R" or on your invoice or confirmation email) will be left in their original packaging in the room of your choice. We will place your furniture in the room of your choice, unpack it and remove the packaging from your home. However, our delivery teams won't remove the packaging from products requiring customer assembly (marked "R" or on your invoice or confirmation email). Upholstery products will be placed in the room of your choice, unpacked and all packaging will be removed from your home. Delivery teams will install legs, backs and recliner handles, and recliners will be unlocked. Large, preassembled bedroom and dining items will be put into place, unpacked and the packaging removed from your home. Our delivery team won't remove plastic covers from dining chairs. We will attach bases to dining tables, hutches will be placed on buffets, mirrors will be attached to dressers, and headboards and footboards will be attached to bed rails. Our delivery team won't assemble trundle beds that require customer assembly (marked "R" or on your invoice or confirmation email). Hardware, including shelving and handles, will be left in its packaging and not installed or attached. Do you need help assembling your furniture? Our Installation and Assembly team can help. Check our Installation and Assembly page for full details. Do you need your old furniture taken away? Although we aren't able to remove it, you can check with your local Habitat for Humanity Restore Outlet for information on donating gently used furniture. Check our Removal and Recycling page for full details. 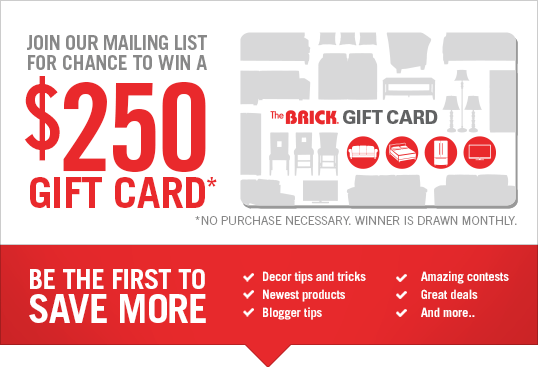 The Brick makes it easy to enjoy your new mattress and boxspring. We’ll unpack your items, remove the packaging from your home, assemble any metal bed frames you purchased with us and put everything in its place. Do you need your old mattress and boxspring removed? We offer removal services for a nominal fee to make the transition to your new sleep set easy. Health and safety regulations require your old mattress and boxspring to be wrapped in a plastic bag for removal. Plastic bags are available at any of our Brick locations. Check our Removal and Recycling page for full details. We’ll remove large appliances (including washers, dryers, refrigerators, ranges and freezers) from their packaging, and put them in place. Refrigerators and ranges will be levelled and handles will be attached. We will remove the packaging from dishwashers and leave the appliance in the room of your choice. Our delivery teams do not install dishwashers. If you purchased laundry pedestals or a stacking kit, we will place washers and dryers on the pedestals or stack the machines. If you purchased new water hoses and a CSA-approved venting kit from The Brick (only) and they are in their original, sealed packaging, our delivery team will hook up your new washer and dryer. We will place smaller appliances like microwaves, range hoods and vacuums in the room of your choice. Our delivery teams cannot connect/disconnect gas lines, electrical wiring, plastic dryer hoses or existing washer hoses to/from your appliances. Our delivery teams cannot move your existing appliances to another area in your home. Do you need help installing your new appliance? Our installation and assembly team can help. Check our Installation and Assembly page for full details. Do you need your old appliance taken away? In most areas, we offer removal services to make the transition to your new appliance easy. We offer appliance removal in most major markets through our Appliance Plus+ program. Check our Removal and Recycling page for full details. For any television larger than 37 inches, we will remove all packaging and place your new TV on its stand in the room of your choice. If you plan on wall-mounting your television, we recommend taking advantage of our installation and assembly service. All other home theatre, audio, video and satellite components, including televisions smaller than 37 inches, will be left in their original packaging in the room of your choice. Do you need help installing or assembling your new electronics purchase? Our installation and assembly team can help. Check our Installation and Assembly page for full details. Do you need your old electronics taken away? Although we aren't able to remove them, you can drop off your old electronics for recycling at Brick distribution centres in some provinces, or at your local eco station or specialized waste disposal centre. Check our Removal and Recycling page for full details. In remote areas we also offer freight collect deliveries, which are arranged by the customer through a third-party delivery company. If you're not sure which delivery service is available in your location, please Contact Us before placing your order. We offer Xpresspost shipping via Canada Post for many of our smaller products. Online orders with a maximum of two eligible items can be shipped via Xpresspost. Once your Xpresspost-qualified order is approved, Canada Post will pick up your items from a Brick distribution centre (DC) and deliver it to your home within two to four business days of the order being picked up from the DC. To receive your order, you'll have to sign for delivery. Otherwise, the courier will leave a notification card indicating how you can get your package. Some regions are not serviced by Xpresspost. If you have any questions about Xpresspost, please Contact Us. Some areas in Canada are outside of our standard Brick Premium Delivery Service and Basic Delivery Service zones. If your order summary indicates your delivery will be done via a third-party courier, then your product will be shipped via an independent freight carrier of your choice. The delivery charge will be collected from you at the time of delivery (called Cash on Delivery – COD). All COD deliveries are shipped from the Brick’s distribution centre. Your third party courier will pickup your product from there and take it to your chosen location. For more information about third-party shipping, please Contact Us. At this time, The Brick doesn't deliver to the United States or other international destinations. In-store pick up is free from most of our Brick locations, but there may be an additional shipping charge for remote locations. During the online checkout process, simply choose the option to pick up your order at a Brick store and select the location that's convenient for you. To help protect you from theft and fraud, we require the person listed on the order to show valid, government-issued photo ID and provide their matching signature when the order is picked up.